Working Women of Tampa Bay is proud to announce we’ve chosen Dawna Stone to headline our Keynote Lunch at our First Annual State Conference.Dawna Stone is a health, fitness and wellness expert who has appeared on The Today Show, MARTHA and morning news programs on NBC, CBS, ABC and FOX. 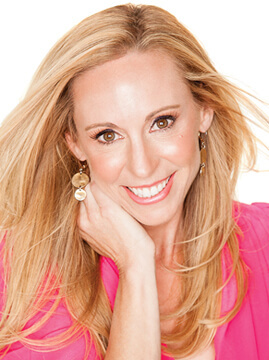 She founded Women’s Running magazine and the Women’s Half Marathon series, which has helped thousands lead healthier lives.Dawna won NBC’s “The Apprentice: Martha Stewart” show, hosted “Health and Fitness Talk with Dawna Stone” on Sirius Satellite Radio and “Healthy Living with Dawna Stone” on FOX. Her first book, “Winning Nice” made Amazon’s list of top 100 business books, while her latest book, Healthy You!, was just released to rave reviews. Working as a Wall Street financial analyst, being President of a $20 million sports nutrition company, and serving as Chief Marketing Officer for a $700 million publicly traded company taught Dawna a great deal about success. Dawna credits several key factors for her corporate and entrepreneurial success. She’ll show you how believing in yourself, setting big goals and asking for what you want can catapult you to incredible new heights! Dawna graduated from UC Berkeley and the Anderson School of Business at UCLA (MBA). In addition to launching and selling her own companies, Dawna is an avid runner and Ironman triathlete. She lives in St. Petersburg, FL with her husband, five-year-old daughter, four-year-old son and 13-year-old puppy. Are you ready to be motivated, educated, and inspired? Our two-day program isn’t about sitting around and listening to other women tell you how they achieved success. It’s about YOU… moving your vision forward and finding real solutions to the challenges working women face every day. This is NOT your average conference. Are you ready to learn more about our State Conference on September 5-6, 2013, in St. Petersburg, Fl? Register now.